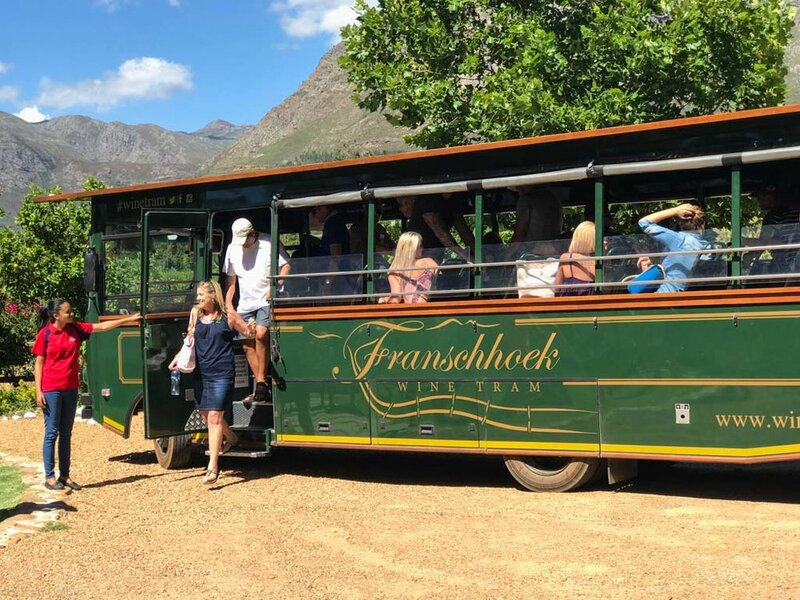 Julie had told me about the Hop-on Hop-Off Wine Tram in Franschhoek and had booked us on it a couple of days after Christmas. It had been quite difficult to get tickets, as it is so popular. There are four “lines” and we got the Blue Line, with our start time of 11 am. The way it works is there are eight vineyards listed, with an arrival and an hourly departure time. The “tram” is either a tram on rails or a motorized tram/bus, depending on the location. 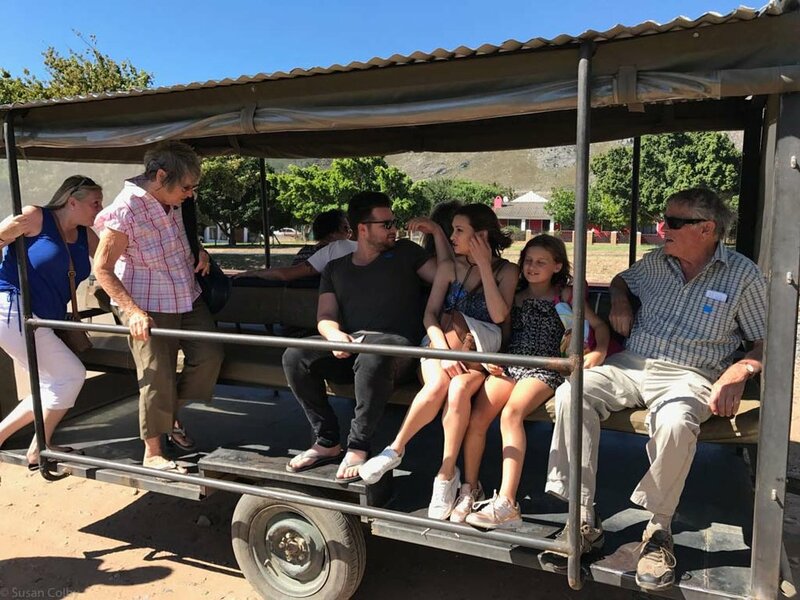 If you want to stay longer at a particular vineyard, as we did, then you hop on the next available tram to head to the next stop. Some of the vineyards provide a tasting as part of the tour, others have a fee. You can also pre-order picnic baskets and some have restaurants on-site. 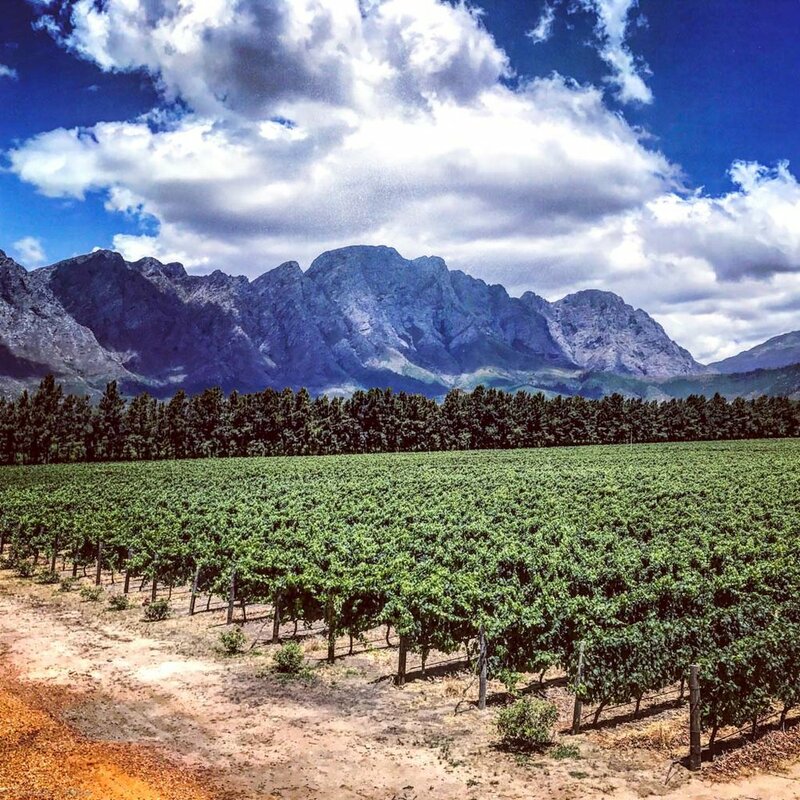 As usual, it was an amazing, clear day as we followed our tour guide’s blue flag to the tram for the first stop, Mont Rochelle, Sir Richard Branson’s South African Hotel & Vineyard and part of the Virgin Limited Edition collection. It was a great beginning to our day, with an excellent tasting in the Country Kitchen. As you can well imagine, the setup was first class, as were the wines! 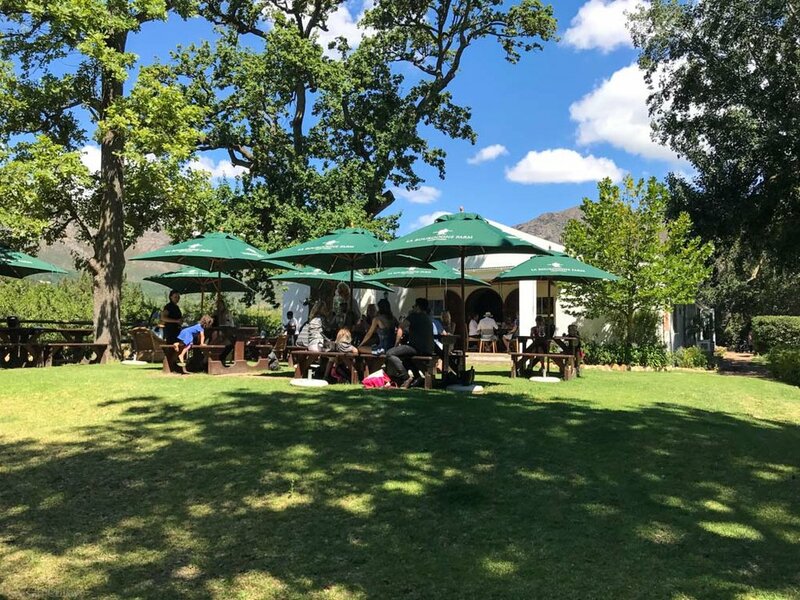 And the location…well, I don’t think you can beat it, set as it is on the slopes of the Franschhoek Mountains and looking out over the valley of vineyards. But we were on a mission. We skipped the next stop, Le Lude where they do sparkling wines, and hopped off at La Bri, where they offer interesting wine pairings. I was intrigued by the biltong pairing so that’s what we did! And it was, as they advertise it, “A unique South African experience.” Mick thinks beer would be better, but tasting the different types of biltong and dried sausage, and the wines they chose to pair it with, was really interesting. La Bourgogne was the next stop and where we decided to have lunch. A lovely old farm, one of the original Huguenot farms that was granted to Pierre de Villiers in 1694, by Simon van der Stel, the first governor of the Cape Colony. We sat out under big, shady umbrellas on to the vast expanse of lawn that borders a small river. We bought a bottle of wine (this was not one on the comp list) and had a very large, delicious cheese plate. Taking our time over the wine and the lunch, we decided to skip the next tram, relax in this lovely place and get on the next one. By this time, it was getting on in the afternoon and enthusiasm was dimming, just a bit! But off we went again, to Rickety Bridge. 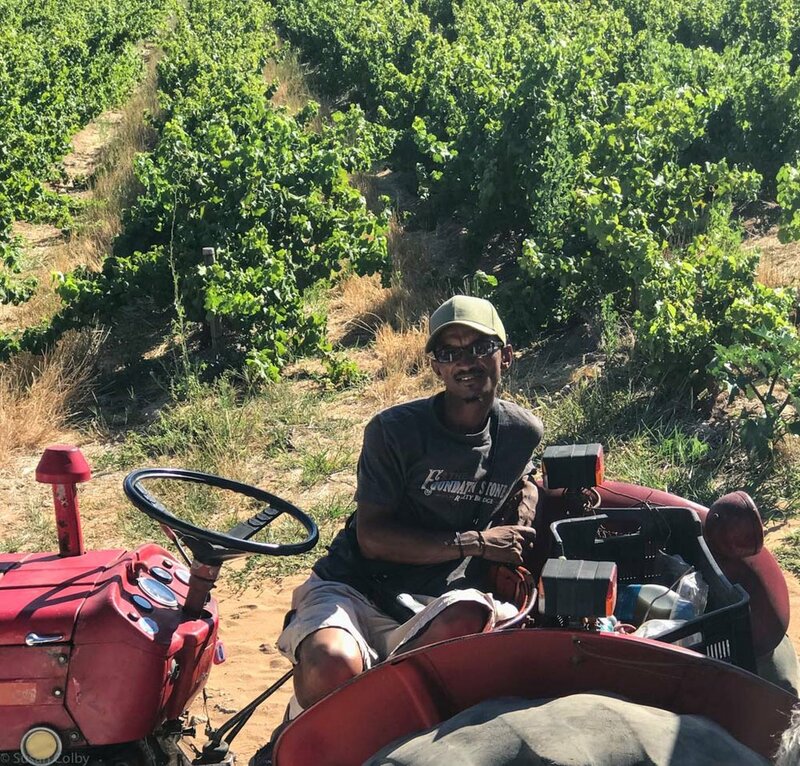 The name was intriguing and we were transported from the rail tram to a farm wagon towed by a tractor and up the dirt road to the winery. The tasting room is described as “sophisticated,” but I found it, after all the older, classic venues, to be a bit overwhelming and the tasting very impersonal. Could be I was just tired! Needless to say, we were on the next tram out, which ended up being the last one. Our server at La Bri - note the clutch of wine glasses! Biltong and wine - who'd've thought?